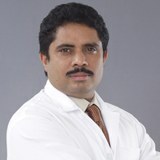 Dr. Austin completed his MBBS from Medical College, Kottayam, he later obtained his MD (Medicine) from JIPMER, Pondicherry, India in the year 1999. In 2004, he completed Post-Doctoral (DM) residency in cardiology from Sri Jayadeva Institute of Cardiology, Bangalore, India. Besides this, Dr. Austin has more than 19 research papers and publications to his credit. He has more than 18 years of experience in the field of Cardiology and has worked in many international cardiology hospitals as Consultant. Dr. Austin practices Interventional Cardiology and specialises in Coronary angiogram, Angioplasty through radial access, Primary and elective Angioplasty, along with Echocardiography (TTE, TEE), ECG and stress test, outpatient and inpatient supervision and 24 hr ECG Holter monitoring analysis among others. His special area of interest is radial access coronary angioplasty. Dr. Austin can speak in English, Hindi, Malayalam, Tamil, Kannada.